The first halves of the last three games have not been good. But say what you want about Chris Armas, in each of those games, Metro regrouped after the break. It didn't help on his debut, but, for the second straight week, a much-improved Metro pulled out a victory with a spirited second half performance. 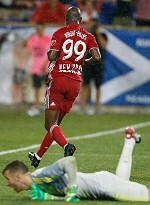 This time, they beat the Revs, 2:0, on goals by Daniel Royer and Bradley Wright-Phillips. Armas made two changes from last week's game, inserting Michael Murillo and recent hero Marc Rzatkowski for Connor Lade and Alex Muyl. How bad was the first half? Metro didn't have a single shot on goal; their only attempt came in the 2nd minute when Aaron Long's header graced the bar off a corner kick. On the other side, Metro kept the Revs mostly at bay, with Luis Robles coming out bravely to stop a point-blank shot on the visitors' lone good chance of the period. Metro started to control the ball after the break, often through Murillo runs on the right flank. The Revs started to foul, and paid dearly in the 69th, after a needless takedown between the right edge of the box and the sideline. Rzatkowski's free kick sailed over everyone's head before it was met by Royer at the far post. The Austrian easily tapped it in. Now, why can't they play like this in the first half? Lineup: Robles, Lawrence, Long, Parker, Murillo, Adams, Davis, Rzatkowski, Royer, Romero Gamarra, Wright-Phillips. Subs: Collin, Muyl, Etienne.